Moscow, July 23, Interfax – A decision to found an All-Russian Committee for the Protection of Orthodox Christians was made at a rally held at Suvorovskaya Square in Moscow on Sunday, an Interfax correspondent said. The rally, which was attended by several hundred people, was organized by People’s Council, Family, Love, Fatherland, For Orthodox Faith, the Union of Orthodox Citizens, the Foundation for the Monument to Patriarch Hermogen and other Orthodox patriotic organizations. 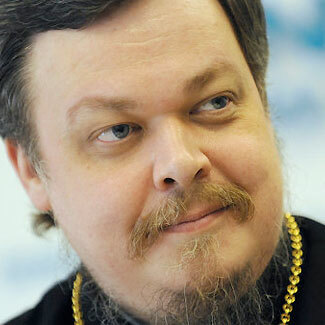 “Today it is very important that people can demonstrate their solidarity, that they are ready to defend their shrines, values and together care about the country’s future and do everything they can to defend their cathedrals, shrines, their patriarch, their church and country from attacks,” head of the Synodal Department for Church and Society Relations Archpriest Vsevolod Chaplin said at the event. It is essential that people, “instead of lying on a coach, understand that we are facing very powerful forces which hate the very prospect of Russia really becoming Russia,” he said. “And since these forces will never stop and never leave us in peace, we need to be able to show our popular civic will, one that is peaceful and non-aggressive and does not respond to a foe’s every sneeze with spite or revenge. Revenge, spite, grievances – all this debases a man, as we know from the spiritual practice of the Orthodox Church,” the priest said. Instead of taking revenge and getting involved in minor squabbles, Orthodox believers should “be able to explain to their foes that we shall never let anything happen in our land that happened in the 20th century: the desecration of cathedrals, the killing of the clergy and flock, an outburst of blasphemous, sacrilegious mockery effected with means of propaganda,” he said. “All this should not be repeated in our history. And we must always, whenever a challenge is thrown to the Church, its leader, people, and shrines, respond to it with a peaceful but very strong, powerful and dignified civic action,” the priest said. “Life will not become easier for us. The talk that the polemic around the Church will subside is, unfortunately, just a talk that is far from reality. Yes, we should be waiting for more attacks, we must always be ready to respond,” the Church representative said. One must never be afraid of being oneself, being socially active and talking everywhere “about God’s truth and attest what is truth and what is lie, what is a virtue and what is a sin, what is a worthy life and genuine happiness, and what is degradation of an individual, a society,” Fr. Vsevolod said. With faith, people “are stronger than everyone else, stronger than those who have money, power, hundreds and thousands of real or virtual votes on the Internet,” the priest said.